With a stay at Pompano Guesthouse in St. Lucia, you'll be within a 10-minute drive of St Lucia Crocodile Centre and iSimangaliso Wetland Park. Featured amenities include dry cleaning/laundry services and coffee/tea in a common area. Free self parking is available onsite. Located in Gansbaai, Oom Piet Self Catering Accomodation is a 4-minute drive from Gansbaai Harbor and 8 minutes from Kleinbaai Harbour. Free self parking is available onsite. Located in George, Pleasant Place is a 2-minute drive from Garden Route Botanical Garden and 8 minutes from Kingswood Golf Estate. 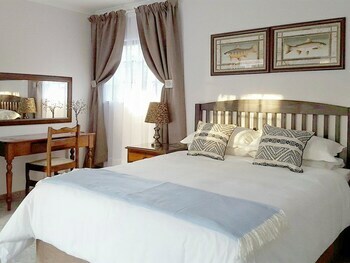 Located in Bluff, A Family and Friends Guest House is within a 15-minute drive of Golf Course at The Bluff and Durban University of Technology. Free self parking is available onsite. With a stay at Acacia House in Sandton, you'll be within a 15-minute drive of Montecasino and Montecasino Bird Gardens. Free self parking is available onsite. With a stay at Ezulwini Berg Resort in Jagersrust, you'll be steps from Drakensberg Mountains and a 3-minute drive from Kilburn Dam.